It was 6:20 in the evening and dark when we set out on a bus from the Liberty Bell Park in Jerusalem, a beautiful park not far from the center of the city that has a large replica of the bell that is hanging in Philadelphia. We were dropped off 15 minutes later at the bottom of the Old City walls just outside the Kotel (Wailing Wall) area. There is a steep drop off right there and the tall outer walls of Jerusalem, lit with large spotlights shining up vertically from the stone base, towered over us. I was on a tour of East Jerusalem organized by the Sheik Jarrah Solidarity movement (http://www.en.justjlm.org/), a group of young Israelis who work with Palestinian partners to prevent the eviction of Palestinian families from their homes, and Rabbis for Human Rights (http://rhrna.org/), an organization supported by 1,800 North American rabbis working to harness the Jewish tradition for social justice causes. Crossing the street away from the Old City walls we immediately entered the Palestinian neighborhood of Wadi Hilwe, part of the village of Silwan in East Jerusalem. Many of the houses looked rundown, streets and sidewalks were uneven, some curbs missing, and the street was sporadically lit. As we walked down the road we passed a modern, low-slung building with illuminated arches that was the entrance to the City of David Archeological National Park. A little farther down the hill was a gated compound with an Israeli flag flying on top. As background, Silwan is a large Palestinian village of about 40,000 people that was annexed by the Jerusalem municipality after the 1967 war. It is part of East Jerusalem, a large section of the city which until 1967 was under Jordanian rule but then was conquered by Israel and incorporated into greater Jerusalem. Silwan, like other areas of Palestinian East Jerusalem, has been neglected by the municipality. Many roads are unpaved, there is no regular garbage collection, and some houses are not connected to the sewage system. There are few schools, no parks or playgrounds. The neighborhood we were visiting near the Temple Mount, Wadi Hilwe, is the location of the ancient City of David, the original site of Jerusalem during the time when King David was said to have reigned. 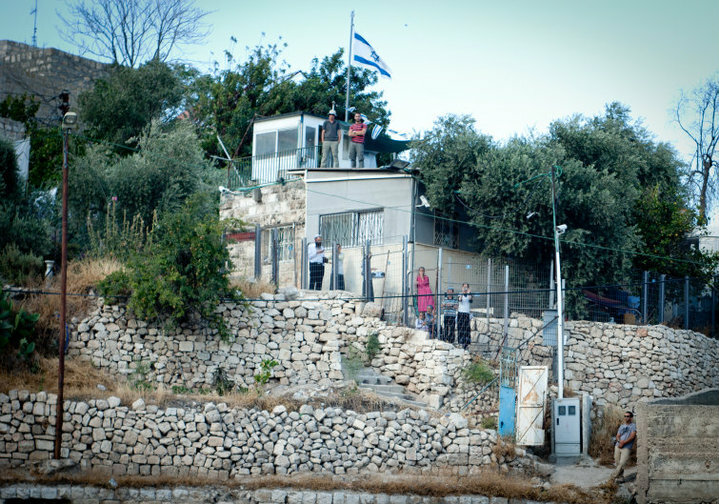 There are approximately 2,600 Palestinian residents in this area and about 60 Jewish families, most of whom live in gated compounds with Israeli flags flying overhead, protected by round-the-clock armed guards costing tens of millions of Israeli shekels each year paid for by the Israeli Ministry of Housing. These compounds are scattered throughout the neighborhood and are part of a decades long effort to replace the local populace with Jewish settlers. Settler house in Silwan. Note the guard post on the roof. 1 – The Ir David Foundation know by it’s Hebrew acronym Elad (http://www.cityofdavid.org.il/irdavidfoundation_eng.asp). 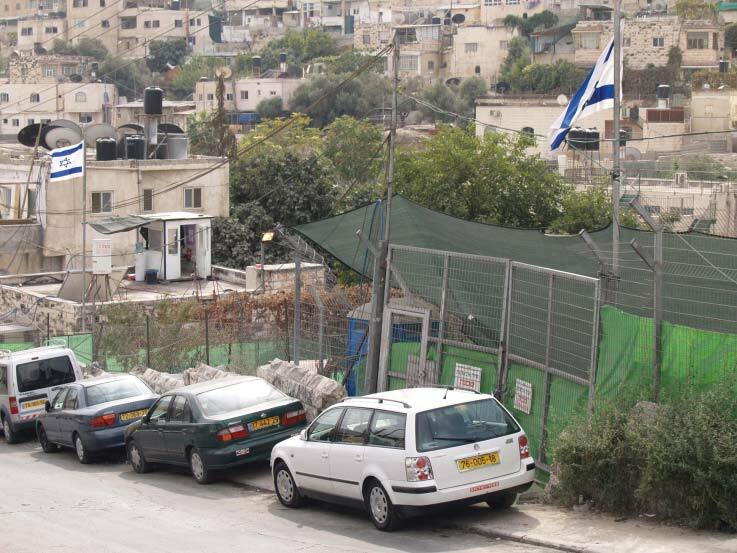 Elad works hand in hand with the government to take over property in Silwan. As an example of this close collaboration, it is the only private organization managing an Israeli national park, the City of David archeological site in Wadi Hilwe. 2 – The Jewish National Fund (JNF) through its wholly owned but little known subsidiary Himnuta. More on this below. The effect on the Palestinian population of these politically connected and well-funded organizations is profound. Residents face the constant threat of protracted legal battles and eviction as every opportunity is used to take over property. There are several strategies used to evict Palestinian residents from their homes in Jerusalem. In this post I will concentrate on just one: the Absentee Property Law. This law, originally used immediately after the founding of Israel, enabled the state to take over the property of Palestinians whose owners no longer lived in the country. It applied to Palestinian refugees who had fled the fighting, or were chased out by the Israeli army, in the 1948 war that resulted from the invasion of the new Jewish state by the armies from neighboring Arab lands. The law was a legal mechanism by which entire neighborhoods of Arab homes and land throughout Israel were transferred to Jewish ownership. Much of this land was used to settle the large influx of Jewish refugees from European and Arab countries after the war. In the late 1970’s, under the first right-wing government led by Menachem Begin, the law was applied to East Jerusalem. Thus, Palestinian properties there became subject to seizure if the owners did not reside in Israel. Arab residents of the West Bank, which is occupied by Israel but not annexed, are considered absentee owners and at risk of losing their property in Jerusalem. The first stop on our evening tour of Silwan was at the home of Mohammed Sumarin. His family’s situation is a classic example of the application of the Absentee Property Law and the expensive legal battles that many Palestinian families have to endure. Opposing the family is the Jewish National Fund (JNF), a large quasi-governmental, non-profit organization that owns 13% of the land in Israel. Although the JNF does good work with ecology and planting forests within the Green Line (the pre-1967 Israeli borders) – the ubiquitous little blue coin boxes for donations were staples in Jewish schools and homes in America for many decades – its Himnuta subsidiary has been active under-the-radar in the West Bank and East Jerusalem acquiring land and houses, and facilitating the construction of settlements. Apparently, even board members of the JNF were unaware of the extent of this activity. This burst onto the pages of Israeli and American newspapers in November as a result of Himnuta’s efforts, in collaboration with Elad, to evict the Sumarin family. The JNF at first denied they were involved until court documents revealed that Himnuta was behind the eviction proceedings. One JNF board member and fundraiser, Seth Morrison, recently resigned in protest when he realized the full extent of these efforts (see his statement at http://www.forward.com/articles/147766/). The legal history of the Sumarin case is complicated, stretching over two decades, but revolves around who is the technical owner of the building. Mohammed Sumarin’s great uncle built the building 75 years ago and, according to the Sumarin family, subsequently sold it to his brother, Mohammed’s grandfather. In that case, ownership of the property clearly passed down through the generations to Mohammed after his grandfather died. However, the JNF contests that Mohammed’s grandfather bought the building and claims instead that ownership has passed down to the descendants of his grandfather’s brother, all of whom live outside of Israel. Thus the JNF wants to evict the family and assume ownership. Court rulings have varied. One ruling ten years ago stated the sale was clearly valid and Mohammed was the legal owner. A second court several years later ruled otherwise when the eviction proceedings were reopened without the Sumarin family present (they were not notified of a new suit being filed). The court ordered their eviction in their absence. Please forward this post to those who might be interested in helping. – For more information about the Absentee Property Law, scroll to the bottom of this webpage http://www.ir-amim.org.il/eng/?CategoryID=353 to download more detailed reports. Coming soon: A close look at Elad and the methods it uses to evict Palestinians, some of which have raised questions of propriety.